Michael Franti and his band are surely having a gratifying month. After years of releasing issue-addressing, conscience-raising records, Michael Franti/Spearhead’s All Rebel Rockers scored the musicians their highest chart position ever, entering the Billboard charts at #39, selling more than 12,000 copies in its first week. On September 2nd, the band shared the stage with Rage Against the Machine, Dead Prez and Anti Flag in protest of the Iraq war at the Republican National Convention. Additionally, Michael Franti’s Power to the Peaceful music festival, headlined by Spearhead, Ziggy Marley, Waren Haynes and Rebelution, has grown steadily over the decade it has been in existence, and drew more than 70,000 fans to Golden Gate Park earlier this month. It would seem that dedication and hard work do pay off. The band is currently on tour in the US. After playing the San Diego Street Scene with the likes of Beck, Cat Power and Vampire Weekend this Friday, Michael Franti and Spearhead will play the Hollywood Bowl with Ozomatli on Sunday. While in Los Angeles, Franti and his band will stop by the KCRW studios to appear on the renowned Nic Harcourt-hosted "Morning Becomes Eclectic." Then on the 23rd, the band will perform on "The Late Late Show with Craig Ferguson" on CBS. 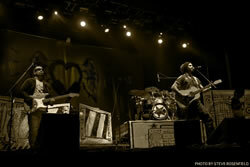 DON’T MISS MICHAEL FRANTI AND SPEARHEAD LIVE! Brisbane, AUS, THE TIVOLI SOLD OUT! Melbourne, AUS, THE FORUM SOLD OUT!